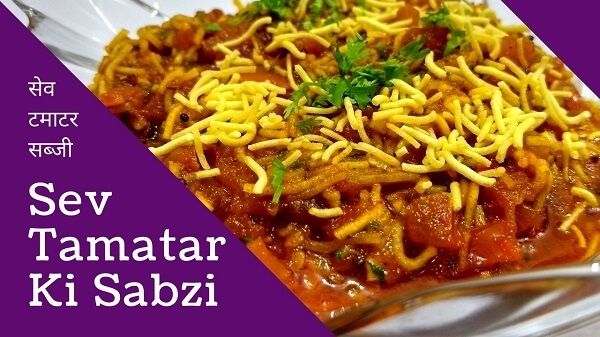 Spicy and delicious Sev Tamatar Sabzi – a famous Gujarati dish prepared with Sev (farsan available in most Gujarati families), Tomatoes and spices also known as “Sev Tameta nu Shaak”. Sev Tomato Sabzji is one of the dishes main dish in the menu of all the highway dhabas & restaurants in Gujarat & Rajasthan. In this recipe, you can use Sev of your choice, like Ratlami Sev, Spicy Sev or Garlic Sev. Learn how to make this Sev Tameta Sabzi at home with this step-by-step guide. Add Mustard seeds, Cumin Seeds & Garlic, sauté for 30 seconds. Add chopped Tomatoes and half cup water, stir well. Now add all the spices – Kashmiri Chilli Powder, Red Chilli Powder, Dhana Jeera Masala, Turmeric Powder and Salt. Also, add Jaggery and mix well. You can add Sugar instead of Jaggery. Cover with lid and cook for 4 – 5 minutes over medium heat. Add Garam Masala and Fresh Coriander, mix well. Finally, add Sev and mix well. Pour the Sabzi in the serving bowl and sprinkle Sev over the sabzi, garnish with fresh Coriander. 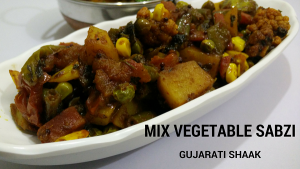 Serve Sev Tamatar Sabzi hot with Roti, Chapati or Paratha.